A headboard can give your room style and complement the size of the room. The slim panel will make your room feel more spacious. The convenience of a headboard will provide you with floor space and makes it easy to make up the bed. 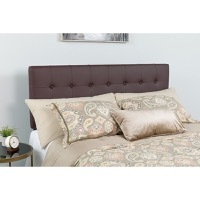 Headboard features button tufting and box stitching. Whether you're updating or starting new, this headboard will get your bedroom looking fresh!